3-disc, 5-hour documentary that summarizes 12 years of public debate on 9/11. 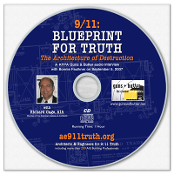 9/11: Blueprint for Truth – The Architecture of Destruction — Research Edition DVD. Two-hour presentation. Updated from earlier editions. 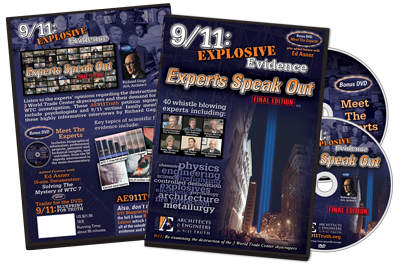 DVD 9/11: Blueprint For Truth plus 9/11: Experts Speak Out DVD Cased Blueprint For Truth Set of Full & Companion Editions ReThink911-Themed “9/11: Explosive Evidence – Experts Speak Out"
9/11 Explosive Evidence Experts Speak Out International Ed DVD in Cardboard Sleeve – Blueprint For Truth 2-Hr. Research Ed DVD Cardboard Sleeve Blueprint For Truth Companion Ed. The powerful new documentary film by Architects & Engineers for 9/11 Truth is now available in 18 languages (subtitled). 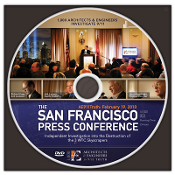 DVD Cased European (PAL 1hr) of 9/11: Blueprint for Truth San Francisco Press Conf Feb 2010 DVD in Case Get all 5 sleeved DVDs for only $24.99! ﻿David Ray Griffin's speech "9/11: The Myth and the Reality" on DVD. ﻿David Ray Griffin's speech "9/11: Let's Get Empirical" on DVD.